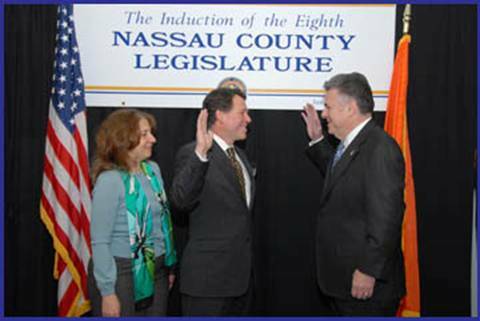 Nassau County Legislator Francis X. Becker, Jr. was recently sworn in for an eighth term as representative of the 6th L.D., a position he has held since the inception of the Legislature in 1996. The installation of Legislator Becker and his 18 colleagues was held at the Nassau County Cradle of Aviation and was attended by religious leaders, dignitaries and elected officials from national, state and local government. Legislator Becker was also appointed as the Chairman of the Legislature’s Towns, Villages & Cities Committee, Vice Chairman of the Health & Social Services Committee, and as a member of the Public Works Committee, the Government Services & Operations Committee and the Veterans & Senior Affairs Committee. Pictured is Legislator Becker being sworn in by U.S. Congressman Peter King as his wife Clementine looks on.